I shoe horn being an author of dramatic fantasy fiction stories into my busy life as a family man with an IT business. The part of the world that most inspired The Kingdom of Valendo setting is the Jungfrau region of Switzerland near Interlaken. Covering an area similar in size to Disneyland, Florida it is a playground stuffed with mountain railways, cable cars, hiking and mountain biking trails, winter ski slopes and some of the worlds most breathtaking scenery. In the late 1970s early 1980s my parents took me here twice, I took my new bride there on our honeymoon in September 1992 and in August this year (2018) we returned with our three train-mad boys to share it with them. For the boys it was the best holiday they had been on except perhaps for Disneyland the year before. This one is a video – the only way to do the waterfall justice. Edit November 11, 2018: In one place in The General’s Legacy I described the waterfall as jetting horizontally out of the rock. This description was inspired by the following photo featuring me on my honeymoon in 1992. You can find the Jungfrau region right here on Google maps. There is one key location I have not covered in this post because it was too far away for us to visit with children but my wife and I did visit it years ago on our honeymoon with a 3 hour each way car drive to get there. I’ve found a great video on youtube documenting the making of a real life fantasy castle. Follow this blog or join my email newsletter to get notified when I publish a new blog post about this soon. Fantasy swords look cool, but are they any good? Unlike real historical swords, fantasy swords, in a generic sense, don’t care about proper weight distribution, an important factor medieval swordsmiths took seriously. The classic medieval arming sword, shaped like a cross, has developed into a very specific shape that is the optimal design for hand rotation when you consider key pivot points in the sword’s geometry. The One Million Project is a collective of creatives offering their work to raise money for international charities engaged in Cancer research and supporting the homeless. I’ve heard the Mistborn series described as swords and sorcery. It has sorcery “in spades” – the fascinating and innovative Allomancy. Think magical power from metals. I’m not sure the swords part really qualifies. The setting strikes me as more 19th century than the traditional psuedo-medieval worlds we most often find in fantasy. The Final Empire is a fun magical romp through a world broken by past events still shrouded in mystery that I’m keen to penetrate by reading more books in this series. The overall style and the age of the heroine (16) make me think YA Fantasy but with enough sophistication to appeal to an adult audience. I would have liked more showing in the writing style, especially in action sequences, than the telling we often get. As a result, there were times I felt force fed events rather than experiencing them. I’m done with criticisms now. The Final Empire was thoroughly enjoyable. The main character Vin is a wonderful blend of strength and naivety with a special but unschooled ability in Allomancy. Her world view is delightfully distorted by her tragic backstory. This gives her an understandable problem trusting anyone and she must overcome this on her quest to end The Final Empire. The Lord Ruler (the Emporer if you will) is immortal and apparently invincible. How can they possibly succeed? This is a trope Sanderson also uses in Steelheart. 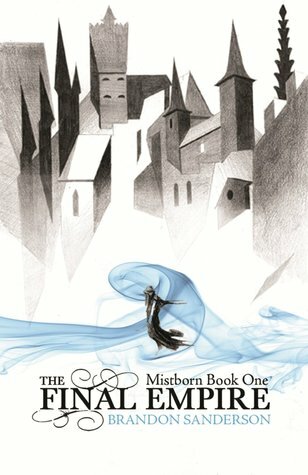 If you love Mistborn The Final Empire and have not read Steelheart yet I recommend adding it to your “want to read” list. Vin’s mentor Kelsier teaches her much about Allomancy and sends her to learn from others with different specialist skills. The story never gets bogged down in this training. It’s woven into the storyline. Of course, there are some things a true hero/heroine is going to have to figure out for themselves. Kelsier is a key player in this story are there are many scenes from his point of view. The grand plan at work in this story is his, but he can’t do it alone. The right questions are answered in this book by the end but there are plenty of others left open for future books. Vin grows as a character but there is still plenty of room to see her grow more. This is a fantastic story that will keep you guessing until the end – how can you kill the invincible Lord Ruler and exactly what is the power of the eleventh metal? 4.5 stars from me overall, but rounded up to a well deserved 5 for Goodreads etc. Almost 2 years ago I was invited to contribute to an anthology of 40 fantasy stories along with other traditionally and self-published authors. I’m honoured to be among them! February 20th, 2018 is release day for the anthology titled OMP Fantasy that is available for pre-order today with a paperback edition coming very soon. The One Million Project goal is to raise £1,000,000 over time for two international charities, Cancer Research (UK) and EMMAUS, a charity for the homeless. In future, there will be fundraisers and several launch parties are being planned across the globe (London, Scotland, Florida, Texas etc) for April. A variety of creative arts projects are underway, but for book readers, two other anthologies may be of interest – OMP Thrillers and OMP Fiction. Discover new authors and indulge in some quick bite short fantasy stories with the OMP Fantasy anthology while raising money for worthy causes. Look out for The Silver Warrior from me. Discover the adventure Quain from The General’s Legacy had on the way to the Battle of Beldon Valley and how he got the Silver Warrior nickname. Each story has its own cover inside the book!